Sandbox has no game objective and players can use the game's set of tools for any purpose whatsoever. Sandbox allows players to manipulate items and "props" (objects that players can place in-game). 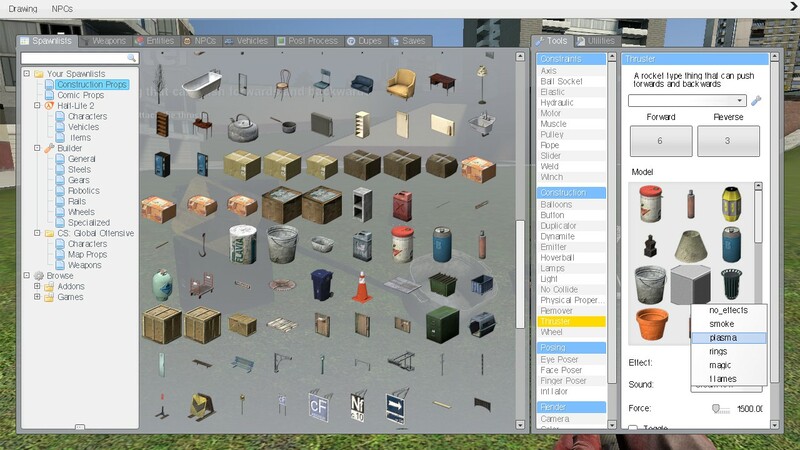 Props can be selected from any installed Source engine game or from a community created collection. The game features two "guns" – Physics Gun and Tool Gun for manipulating objects. 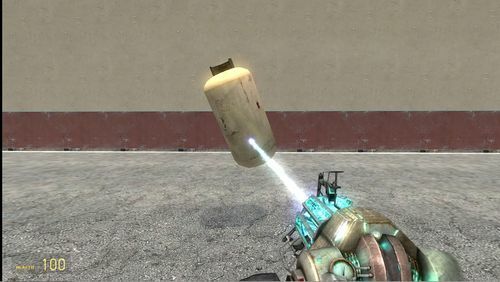 The Physics Gun allows objects to be picked up, adjusted, and frozen in place. creating controllable wheels, thrusters, winches, lamps, explosives, prop spawners, etc. The Tool Gun is also used to control add-ons created by the community. Left click - Use tool gun, pick up object with Physics Gun, etc. Right click - Freeze object, etc. Scroll wheel - Select "Weapon", move objects held in Physics Gun beam inwards/outwards etc. This menu is the most important feature of Sandbox. It is accessed by the Q key. 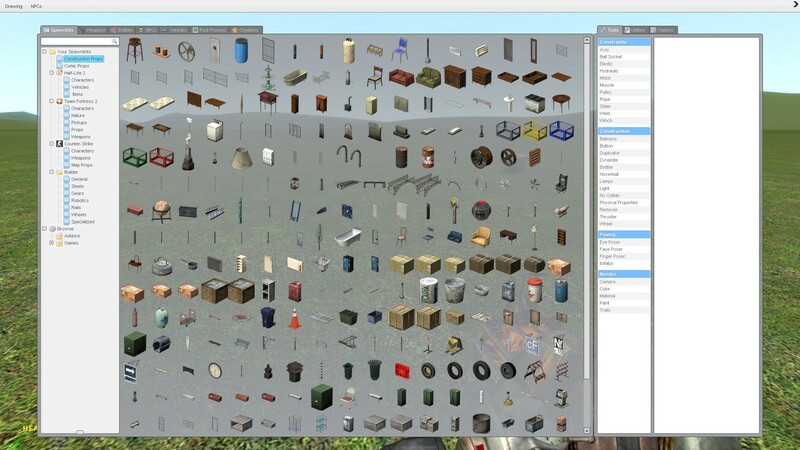 It is from this menu that you can spawn props, entities, weapons, NPCs, vehicles, etc, select a tool to use with the Toolgun, and alter some player and game settings. The Physics Gun is used for picking up objects, manipulating them, and freezing them. To hold an object in the beam, the Physics Gun should be pointed at the object, and left click should be pressed and held. The object can then be moved around with the mouse. The object held in the beam can be rotated in all directions by pressing E while moving the mouse. To rotate the object so that it's angles are aligned, press Shift+E while moving the mouse. To move an object held in the beam inwards or outwards, use the scroll wheel. To freeze an object, point the Physics Gun at the object, left click, then while still pressing left mouse button, right click. To unfreeze an object, point the Physics Gun at the object then left click. The Tool Gun allows players to manipulate a variety of functions, spawn items, change the properties of props, etc. The desired tool can be selected using the list on the right hand side of the Spawn Menu. There are many different functions which the Tool Gun can perform. The lists of tools which follows only shows the default tools, these vary depending on what version of Garry's Mod you are using, many more tools can be added by installing add-ons, and mods. These change how selected props interact and connect with eachother. For example props can be welded together, attached together with a ball socket, roped together, etc. A list of these tools follows. 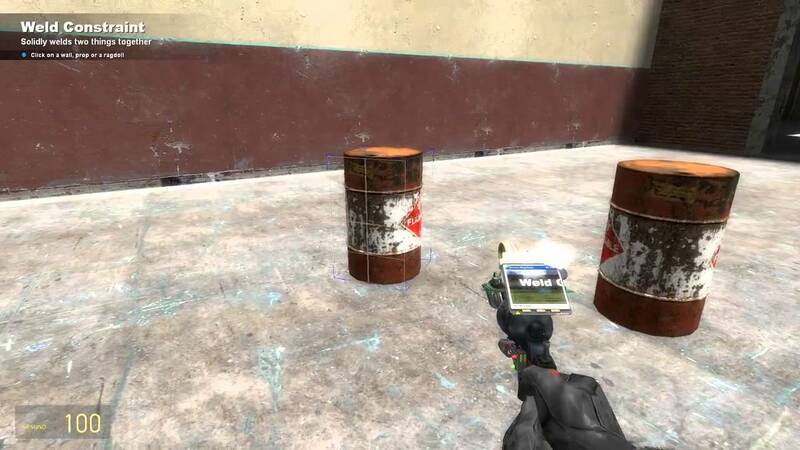 These spawn controllable items, alter the properties of a prop to make it carry out the desired function, etc. For example wheels can be spawned which can be controlled with the keyboard, props can be magnetized, controllable lamps can be spawned, etc. These are for ragdoll posing. These are for altering the color, material, and effects emitted by items and props. (With exception of Camera tool, which spawns a camera).